The view from our seats during the first inning. Ed Smith Stadium, where the Birds play in the spring, is a bright and beautiful park. If you have a chance to see a game here, you should. We really enjoyed our seats out in left field as we had individual chairs and sat at a long bar. We were a ways from the action, but that was good last night. We returned to Central Park this morning for some more batting practice, but playing two days in a row might have been questionable judgment. Al is icing his knee by the pool and I’m looking for my coordination for I seem to have lost it. We certainly see why there are a set of golf tees on every course for people 55 years and older. 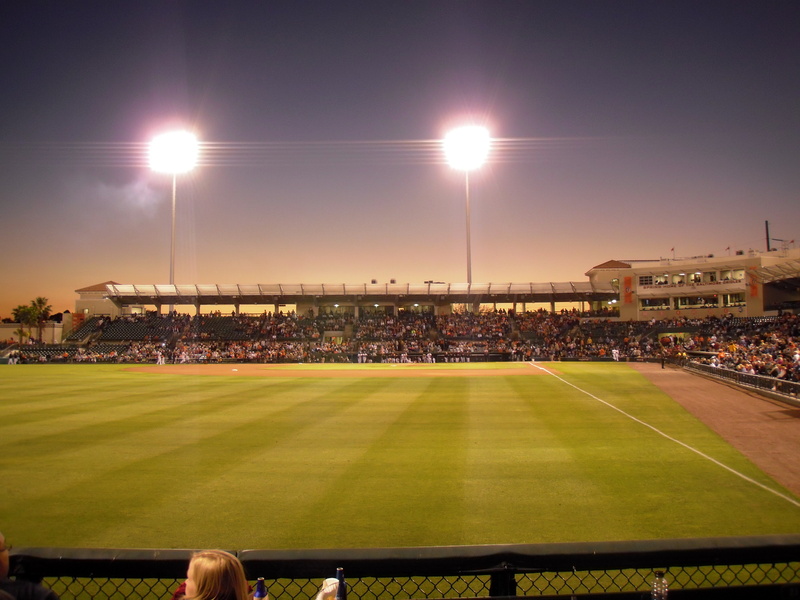 Tonight we’re off to see the University of South Florida take on Jacksonville, while tomorrow we’re going to the Orioles’ minor league complex at Twin Lake Park, followed by the Orioles versus the Twins at 1:00. Thursday not only includes an Oriole game in the afternoon, but Reid Guengerich’s Babe Ruth League game in the evening. Reid’s brother, Jake, is a 3-year New Market Rebel and mom, Sherry has invited us to spend some time with the family and enjoy a home-cooked meal. It’s always nice to feel at home, so far away from home. Oh, yeah, we're on a road trip! 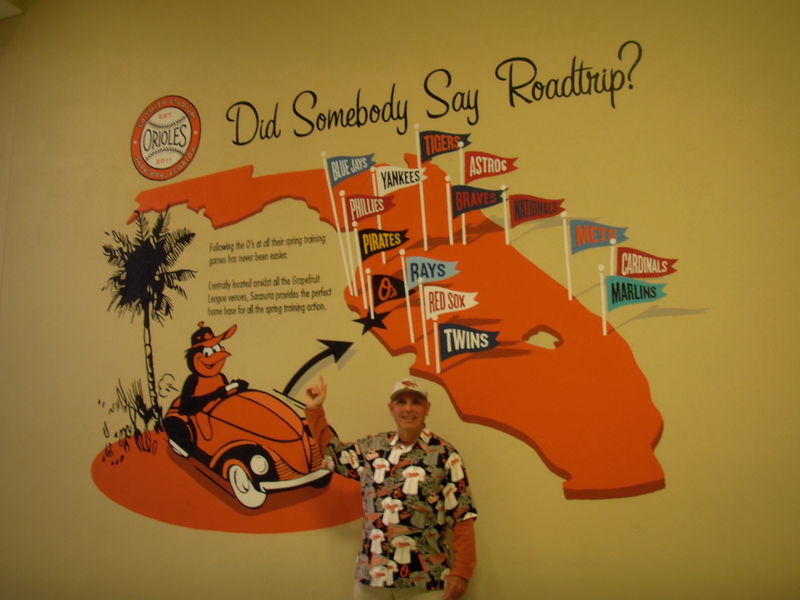 This entry was posted in Spring Training Trip 2012 and tagged 55 years old, Baltimore Orioles, Central Park Brandenton FL, Ed Smith Stadium, exhibition game, Pittsburgh Pirates, Sarasota FL, University of South Florida. Bookmark the permalink. Thanks, Charlie. 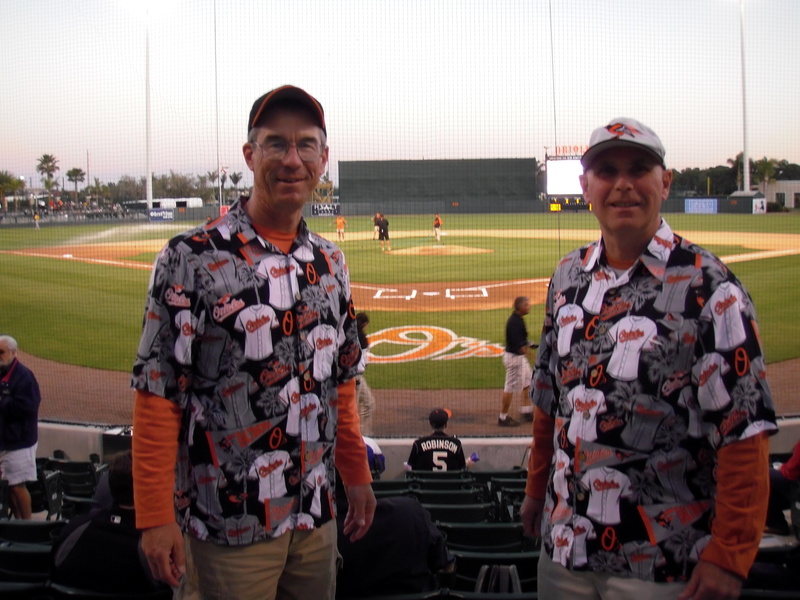 You need to find a similar Nats shirt!